The opioid crisis is a national emergency, roughly 64,000 Americans died from drug overdoses in 2016. This emergency has cost our nation nearly 80 billion per year, much of which is attributable to lost earnings and employment. This crisis devastates the lives of working families. 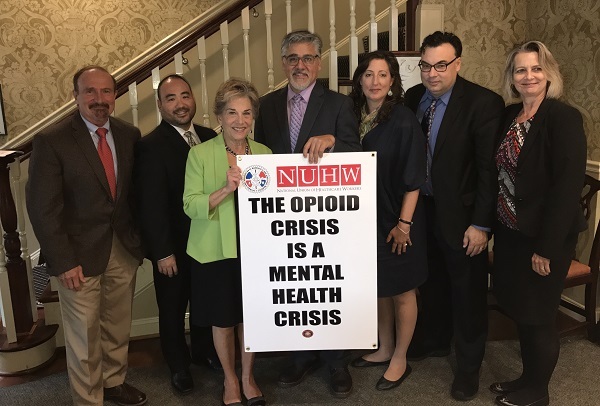 Members of the IAM Legislative Team and National Union of Healthcare Workers (NUHW) recently visited Washington, D.C. to lobby on the opioid and mental health crisis. The week began with Rep. Tim Ryan (D-OH) taking part in a discussion with NUHW on the opioid epidemic. NUHW is advocating for the extension and expansion of funding to address the opioid crisis that threatens our nation. NUHW members along with the IAM legislative team will continue to address this national emergency and lobby elected officials. NUHW is a member-driven, democratic union that represents 14,000 healthcare workers.